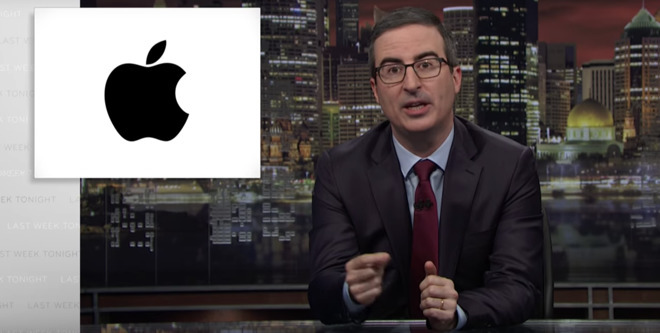 On Sunday night's episode of HBO's "Last Week Tonight," host John Oliver talked about companies placing profits overseas in order to avoid U.S. taxes — specifically using Apple and CEO Tim Cook as an example. On Sunday's 16-minute segment, Oliver discussed the myriad ways that American corporations avoid paying taxes. On the occasion of the April 17 federal tax deadline, Oliver discussed the tax reform bill signed into law and the cut to corporate tax rates as a result. Attention soon turned to Cook, about seven minutes into the segment. Oliver begins by stating that Apple "for years has been deferring paying U.S. taxes on foreign profits, by stashing the money overseas and not bringing it back." He listed the figure of $269 billion in overseas cash. The segment shows Tim Cook testifying before Congress in 2013, stating that "we pay all the taxes we owe, every single dollar. We don't move intellectual property offshore, and use it to sell our products back to the United States to avoid taxes. We don't stash money on some Caribbean island." Oliver goes on to state that while Cook is correct about the "Caribbean island" part, Apple does indeed stash profits on an island — Ireland. Later in the segment, Oliver discusses how Apple announced a round of U.S. investment and job creation following the passage of the tax reform package, which was praised at the time by President Trump. However, Oliver says that Apple was planning to create jobs anyway, such as with the construction of its new campus. This is backed up by Cook, in an ABC interview, stating that "there are large parts of this that are result of the tax reform, and there's large parts of this that we would have done in any situation." Most of what Oliver says is true, if incomplete. Cook is quoted accurately, although on the Ireland question, the segment omits the part about Apple fighting with the European Union about the size of its arrangement with Ireland, and that Apple is paying taxes in accordance with arrangements it made with the Irish government. Additionally, it leaves out how adamant Apple has been over the years about wishing for changes in the tax code in connection with bringing foreign profits back to the U.S. The video had been viewed more than 735,000 times as of noon on Monday.